This post may contain affiliate links. All opinions are 100% mine. So you’ve setup your new smartphone and now you’re faced with the whole world of apps. Which ones are just plain bad? Which ones can you not live without? The options seem endless so we’ve compiled a list of must-have apps for Android phones. And yes, we know there are way more than 10 great apps, so we really selected 10 app categories. 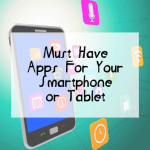 Why Trust Our Must Have Apps List? Google Maps – This typically comes pre-installed and is seriously powerful as it not only provides turn by turn directions, it also uses Google’s local search to help you find new places in your area. I’ve heard other companies offer navigation apps but we’ve always found Google maps are the most up-to-date for our area. Social Media – Pick your poison or take ’em all. Facebook, Twitter, Instagram, Pinterest, Reddit or any combination. Your new smartphone allows more social options at your fingertips. Email – Keep connected with everyone through Gmail, Yahoo or your business email. Just be sure to grab the app directly from the email provider, if possible. Shopping – Check to see if the stores you shop at have their own apps. A lot of times, you’ll find great deals are only available through a store app. While you’re at it, install Key Ring Reward Cards app to free up space on your physical key ring. Earn Rewards – There’s a lot of reward programs but we personally use Viggle to earn rewards for watching TV and shopkick for shopping rewards. Both programs allow you to earn points and turn in your points for gift cards. Music – Even if you’re not a huge music fan, you’ll probably find a time when a little music would elevate your mood. Amazon Music provides instant access to your entire music library and if you have Amazon Prime, you also get access over a million songs and hundreds of custom-built playlists. If you don’t have a music library or simply prefer the radio, try the TuneIn Radio app and stream over 100,000 real radio stations, playing live from around the world. Games – Now this probably could use a whole other top 10 list dedicated to different types of users. Thankfully, a lot of game creators offer free versions of their games so you can pick your favorites. Here’s just a sampling of the games we have: 250+ Solitaire Collection, Words With Friends, Five Nights at Freddy’s, Madden NFL Mobile, and Terraria. Web Browser – The ones that are built-in normally have limited features so do yourself a favor and grab Google Chrome. If you add LastPass and Xmarks, you can even keep your passwords and bookmarks synced between all of your browsers, no matter what browser you choose to use at home or work. TV & Movies – Most digital movie providers offer an app so that allows you to keep your collection at your fingertips. We love Netflix, Flixster, and Google Play Movies. Books – There are a handful of reading apps but since most of our digital collection lives on Amazon, we gravitate towards our Kindle or the Kindle app. We also use our library digital loan feature through Overdrive, Zinio, and Hoopla. Did we miss your favorite app? Tell us about it in the comments! omg I love that you have a device all to yourself, my ipad is filled with kids junk!! Although the new one I got from Netlfix I am planning on keeping solely to myself I think MWAHAHAHAHAHAAHAHAHA! two apps I HIGHLY suggest are flipp for grocery flyers AND cozi… not that I have used it recently but I do like it when I do. I don’t think we’d survive sharing devices. Between homeschooling, blogging, work, and everything in between, we’d constantly be arguing over the devices. Flipp sounds great so I installed it to try it out.